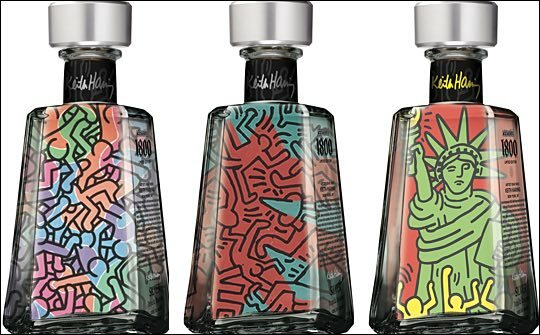 Famous for combining world class design with expert craftsmanship, 1800 Tequila has selected the late Keith Haring to be the newest iconic artist to adorn the Essential Artists series limited-edition bottles. Haring will have the posthumous honour of being the artist featured in the seventh Essential Artist series, which over the years has featured a variety of talented artisans, including Jean Michel Basquiat, Gary Baseman, Studio One, and Shepard Fairey, among others. Known worldwide for his unique, bold style mixed with social activism, Haring was selected as the sole artist for this year’s release; six of his original designs will adorn a limited run of special edition 1800 Tequila bottles. The Essential Artists series is an annual collaboration for the premium tequila brand that celebrates a dynamic range of original artwork and a chance for artists to take their designs and techniques beyond traditional mediums. Each of the artists selected for past series were recognised for being both influential and inventive within their respective genres. Haring, who got his start creating subway and street murals, became renowned for his bright colors and bold lines in his public works, which often carried an important message. Throughout his short lived career, his public works of art adorned the streets of cities worldwide conveying messages that raised awareness about socio-political themes, such as AIDS, drugs and violence. Similar minimalistic values live at the core of 1800’s liquid; housed in a revolutionary bottle, 1800 Silver Tequila is expertly aged and consistently smooth. Made from 100% blue agave, the liquid is double-distilled and matured in American oak barrels for 15 days, then blended with a touch of aged reserves for added complexity. The result is a premium tequila with a smoother, more interesting flavour than most on the market. The limited edition 1800 Tequila Essential Artists series bottles (750ml/40% ABV) will be available at liquour stores in select markets beginning Spring 2015 for US$30.